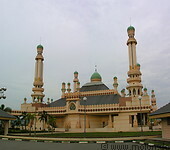 16 photos of the Jame'Asr Hassanil Bolkiah mosque in Kampong Kiarong in Brunei. 18 photos of Bandar Seri Begawan, the capital of Brunei. 13 photos of the Omar Ali Saifuddien mosque, one of the most impressive modern mosques in the east. 12 photos of the Brunei river and the Kampong (Kampung) Ayer water village. 7 photos of the Tamoi mosque, which lies next to the Kampong Kiarong water village.